These directions on how to meditate are taken from the 18th century Puritan theologian Thomas Boston. Enjoy! Be resolute to meditate on this subject and finish. Your mind will be pulled in all kinds of ways. Satan will try to divert you. Do not have it. Write out a short description of what the subject you have chosen is. If there are different kinds or categories within your subject list them out and consider the differences. If possible, consider the causes of your subject and write them out. Consider the effects of your subject and write them out. Consider the properties of your subject. Of what does it consist? Write these out. Consider if there are opposites of your subject. What are they and why are they opposites? What things can your subject be compared to? Is there anything similar? Look up and examine all the Scriptural testimony concerning your subject. Does it shed further light for any of the previous? A topical concordance would be good for this. Think and enlarge on the subject that your heart my be affected and touched with it. Pray that God would give you a suitable relish and affection for the subject at hand. Mourn the lack of this affection in your soul to God. Work to deeply desire the affection for this spiritual subject that you lack. Confess your inability to do for yourself what you lack to God. Ask God to work in you this desire, and petition him for it dearly. Believe that God will grant your request. Conclude all of this with thankfulness to God and commit yourselves to him. For further reading see The Whole Works of Thomas Boston, Volume 4, p. 453. The Duty of Solemn Meditation. This is an updated version of my last post, Beholding the Glory of the Gospel. Essentially this is a step by step guide for what to do when reading your Bible. I have updated this post to better reflect what most helps me get into the presence of God and to experience him. This is something to go through once you have your Bible in front of you and have a Bible reading plan to start. If you’re more of a neat-nic like me, you might find this helpful (if not, you may just be overwhelmed). I find that if I don’t have a plan for how to read, I simply read my Bible and just go on my way without it having any affect on me. This plan is something I’ve gathered together from a few different sources over a few years. It really helps my Bible reading affect my soul, and work change in me, rather than just being something I glance over. Before starting you may want to grab a coffee, get out a journal, maybe light a candle, or turn on some quiet music that helps you get into God’s presence. To go through everything here will probably take a few sittings, so some people may find it better to pick and choose some things that are most helpful for them. My hope is that this will help you to more deeply enjoy, know, and be swallowed up in the glorious majesty of Jesus our king! to one a fragrance from death to death, to the other a fragrance from life to life. Remove other cares from my thoughts. If necessary list them out for dealing with later. Get my heart impressed with an awful sense of the majesty and holiness of God into who’s presence I am going, and who’s word I am about to hear. See Psa. 89:5-14; Isa. 6:1-5; Psa. 46:1-11. Apply Christ’s suffering, death, and his imputed righteous life in my place, to myself and my sin and even my self made righteousness that stands between my soul and God. Examine myself and stir up in my heart great spiritual desires for my own soul’s needs and deficiencies. Treat the reading with great respect and read without many distractions or breaks which show contempt for God who is speaking to me by his word. Read each verse as if it is to me. See Thomas Watson here: “Take every word as spoken to yourselves. When the word thunders against sin, think thus: “God means my sins;” when it presseth any duty, “God intends me in this.” Many put off Scripture from themselves, as if it only concerned those who lived in the time when it was written; but if you intend to profit by the word, bring it home to yourselves: a medicine will do no good, unless it be applied.” (See Watson’s great little book on spiritual disciplines, Heaven Taken by Storm.) Donald Whitney says of this quote: “Watson was right when he said, “Take every word as spoken to yourselves.” But we cannot do that until we understand how it was intended for those who heard it first. If you take every word of God’s call to Abram in Genesis 12:1-7 as spoken to yourself, you’ll soon be moving to Israel. But if you understand that particular call as unique to Abram, you can still discover the timeless truths within it and apply every word to yourself. Have you followed the call of God to come to Christ? Are you willing to obey the voice of God wherever He might call you—to a new job, a new location, the mission field, etc. ?” (See Whitney’s Spiritual Disciplines for the Christian Life). Consider each section of Scripture prayerfully, diligently, and slowly, not carelessly passing by anything so as to miss anything God would have for me. Prayerfully consider how each verse makes me feel, and also how the author (both the Biblical, and ultimate author, God the Holy Spirit) feels in this writing. Think on the emotion that rises and send it up to prayer to God for every sentence or so. This is the gateway to real interaction with God. Do this until a word from God stands out in my heart by the Power of the Holy Spirit. This can be a word specifically to my spiritual need, situation, fear; or a word that frightens me or gives me deep concern. Then make a list of everything it says about God (Father, Son, and Spirit). List anything that it tells you about yourself. List any examples to be followed (or things that need to be avoided). List any commands to be obeyed. Finally, list any promises to claim. When this is all done, choose the verse and truth that is most striking and helpful to you (sometimes nothing in particular will really stand out, if this happens just choose the one that most strikes you, even if it doesn’t seem that great – often God will surprise you with these). Paraphrase the thought or verse in your own words. What does this text show me about God for which I should praise or thank him? Adore, praise, and thank him for this. What does the text show me about my sin that I should confess and repent of? What false attitudes, behavior, emotions, or idols come alive in me whenever I forget this truth? Confess and repent of this in prayer to God. What does the text show me about a need that I have? What do I need to do or become in light of this? How shall I petition God for it? Petition and plead with God for this in prayer. How is Jesus Christ or the grace that I have in him crucial to helping me overcome the sin I have confessed or to answering the need I have? Pour out your thanks to God for Jesus and his salvation. How would this change my life if I took it seriously— if this truth were fully alive and effective in my inward being? Also, why might God be showing this to me now? What is going on in my life that he would be bringing this to my attention today? Pray for all of your needs and pressing concerns. Pray for others on the truth that God has revealed to you. If you have a prayer list, use it here. There are many other good devotionals that I didn’t list because they aren’t really arranged chronologically in order to be a companion to reading through the Bible, but rather as something to be read on their own. I’m also sure that there are other devotions that are arranged to be read chronologically with Bible reading that I haven’t heard of yet. If you know of any, feel free to post them in the comments! I’ve gleaned these directions from several authors. The Approaching God and Hearing God sections are mostly adaptations from a sermon (which I can no longer find) of the puritan Thomas Boston. Some of the content in the Hearing God section is from Donald Whitney’s excellent Spiritual Disciplines for the Christian Life. The Tilling the Soil and Meditation sections are taken directly from Tim Keller’s great book Prayer. All Scripture quotations are taken from the English Standard Version. May God provoke you to more awe, delight, and satisfaction in him through his word in the coming year! I‘ve been trying to hone in on my Bible reading and prayer and actually have it be genuine time with God, leading to genuine change in my heart. I’ve found that without some kind of organization, I typically gloss through my morning Bible text, and my reading basically just becomes a meaningless means of works righteousness; a box I can check off that does me no good. In the last few years I’ve looked at several suggestions of Bible reading methods and prayer models, and the following is my attempt to converge many useful suggestions into one system. The following is a way to go about meeting with God once you’ve sat down and have your Bible open. If you’re an OCD neat-nick like me, you may find this helpful. Note that this is for people who already have a reading plan they intend to use for their daily Bible reading. I don’t intend, or suggest anyone else go through everything here in one sitting. But instead I plan to choose some things from this every morning as I think they’ll help me. I owe much here to Tim Keller, and some to the puritans Thomas Boston & Thomas Manton. This will likely remain a work in progress as I learn what is most beneficial to my soul. Here’s what I have so far. I hope it may help you on your journey to walk closer, and to more deeply enjoy the beauty of our God. Fear of God: Get my heart deeply impressed with an awe filled sense of the majesty and holiness of God into who’s presence I am seeking to go, and who’s voice I am seeking to hear. Delight in the greatness of God and in my smallness in light of his immensity. Delight that he commands all things, and that all things are for his greatness and are at his sole disposal. See Lk. 8:18, 2 Cor. 2:16, Ps. 89:5-14, Isa. 6:1-5, Psalm 46:1-11. Love of God: Apply Christ’s suffering and death for my inherited sinful nature, for my evil heart toward him in actual sin, and even my evil self-made righteousness that stands between my soul and him. Apply his righteous life infused to me, and counted as mine because of his amazing divine mercy. Consider God’s eternal decree to save me before the foundation of the world, and the fact that he loves me dearly enough both to die for me, and to send his only Son to do so. Consider that God the Father constantly feels great, deep, unrelenting love, gladness, and joy toward me because of his pure mercy and what his Son has done in my stead, and the righteousness he has clothed me with. See 2 Cor. 5:21, Rom. 3:21, Rom. 5:6-11, Zeph. 3:17-18, John 10:27-30. Stir my affections: Examine myself and stir up in my heart great spiritual desires for my majestic God and Father and for knowing him more and for my becoming like him. See 1 Tim. 4:16 & John 15:5. Gospel Song: Read or sing a song or hymn from a psalm or hymn book. The one I’m experimenting with now is The Psalms and Hymns of Isaac Watts by Soli Deo Gloria. Prayer Book: Read and pray a prayer from a prayer book. The Valley of Vision is an excellent option. Pray for eyes to see: Pray that God would give me assistance in seeing, feeling, and hearing what he has for me in his word. Pray that he would direct the word to me as I need it, and that he would press it home on my heart with his blessing in order that I may be enlightened, sanctified, strengthened, humbled, or raised up by it, as my case requires according to Psalm 119:18. Pray for the Holy Spirit: Pray that God would pour out his Spirit on me through the reading of his word according to the promise in Pr. 1:23, knowing that none of these actions procure God’s action toward me, but that he acts according to his own will, and pours out his Spirit on whom he wills. What truth has caught the attention of my heart or mind? Think about this truth. What is it really saying? Put it into my own words. Why is God showing me this today? What is going on in my life right now? As thoughts become clear or convicting, write them down. Talk to myself in the presence of God (Soliloquy as demonstrated by the psalmist). Ask myself: If this truth were explosively alive in my inner most being, how would I be different? If I really believed this at the bottom of my being would I be different? How? How does God want to transform my heart, thinking, habits, relationships? Where in the scripture I just read is it prompting prayer? What type of prayer responses does this text ask me? In light of my meditation, in what areas should I pray? Pray freely about these, and also anything else that is on my heart or mind. Also pray for others about these things. Incorporate my daily prayer list. The Bible is not just my story — it is first and foremost God’s story, then our story, and finally my story. What does this truth and the passage reveal about God’s heart for the people and world around me? (e.g. family, extended family, neighbors, workplace, church, city, nation, world) Who or what has God put on your heart today? Pray this truth for them. Adore God/Christ/Holy Spirit for who He is in this passage (e.g. His attributes revealed in this passage). Confess the sinful emotions, attitudes, and behavior that result in me when I forget who he is in this truth I have read. Supplicate (ask), “What do I need to become in light of this truth?” Make a plan. Ask for God’s comfort, wisdom, and strength in applying this truth today. End by beholding, adoring, and appreciating some aspect of the excellence and beauty of Christ. Close my scripture reading with a blessing or promise or view of the beauty of God in his word ideally from the reading for the day. Dwell on this throughout the day. Try and think how it fits into biblical/systematic theology, delight in it and think on it. Throughout the day ask questions of this truth to God in prayer, and ask God to give me understanding, and a proper emotional response to it, and to bless me through it. Delight in, and praise God throughout the day through this revelation given to me. If you don’t know what the Family Expositor, or who Philip Doddridge is, you’re not alone. Philip Doddridge is an extremely obscure later puritan, and the Family Expositor is his commentary and devotional on the New Testament. Most people have never heard of either, and even enthusiasts of puritan literature mostly haven’t heard of him, let alone had the luxury to read him. 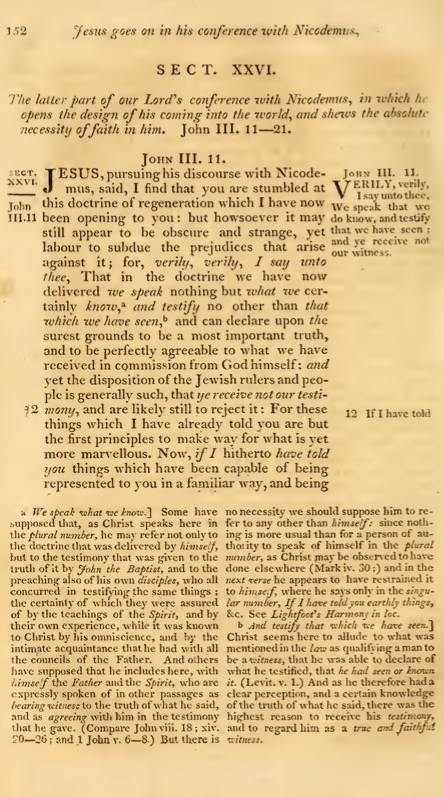 I first encountered Doddridge’s Family Expositor when I saw it referenced by Jonathan Edwards. Edwards references Doddridge time after time in his Blank Bible. Of the 423 page New Testament in his Blank Bible, Edwards mentions Doddridge 351 times. That’s almost once per page. In comparison, the only 2 other commentaries Edwards regularly used, Matthew Henry, and Matthew Poole, have only 9 and 7 mentions respectively.6 Doddridge’s Family Expositor was Edward’s most used commentary on the New Testament. Philip Doddridge was an early 18th century non-conformist pastor, and like Matthew Henry, he spent much of his free time writing his commentary. Doddridge notes in the preface that he intended this commentary to be used by families at the dinner table. The forgotten practice of family worship is a great way to use this commentary; the expanded translation, and the devotions at the end of each section (see below) work together seamlessly as a perfect tool for family devotional reading and discussion. This may well be the book that Jonathan Edwards used for his family devotions. Doddridge’s paraphrase is lengthy! As you can see above, this is not even 2 verses. But even in addition to his paraphrase, throughout he includes lengthy notes on the Biblical text. The notes above are a good example of what pervades the book. The notes are so extensive that by themselves they would comprise a complete commentary. These notes are glorious! I’m a sucker for great footnotes, so I love this. The notes address many questions that would naturally arise (such as the “we” reference above) and explain the meaning of scores of the difficult passages and phrases in the New Testament. The notes are one of the best things about this work. One of my favorite things about The Family Expositor though is that it includes devotions for every section of the New Testament. This is great because it allows the reader to base their devotional reading on their Bible reading, rather than the other way around. The reader can read the paraphrase on the section of Bible they are in at the time, and then read the devotions on that same scripture. This way the Bible is primary, and the devotions can be used as needed on any given passage. I like to read devotions particularly when I’m in a stale season in my reading. The devotions in the Family Expositor in particular help to heighten my appreciation and sharpen my savoring of the great things of God. In the Family Expositor, Doddridge has given us, I think, one of the greatest works on the New Testament ever written. After a couple years of searching for a good volume of The Family Expositor in vain, I gave up and decided to publish my own. I decided to use the large 1836 single volume version, but to break it up into 2 volumes (reluctantly, but required by the book printing service). The volumes are about 500 pages each and are large, measuring to 8-1/2″ x 11″. I designed the covers to be plain but striking. The first volume contains the Gospel harmony and Acts, the second volume contains the New Testament Epistles and the book of Revelation. The pages are based on the scanned images of the document as seen above. While the images are not always perfect, and there is some rare blurring or fading, the books are eminently readable. The books are more expensive than I want them to be, but with the cost for printing with the large page count and size, the current price is the best I could do. See the volumes in hardback and paperback below. Enjoy! I’m waiting for the day when Doddridge’s Family Expositor will be republished in handsome cloth bound volumes, re-typeset for a hand held size. But until then, I think these volumes are the next best thing. I hope they give you as much pleasure as they’ve given me. One of the great turning-points that led me to have a greater awe in the Bible was when I found that the Bible spoke of Jesus before he ever came. The Bible spoke of him hundreds, and almost thousands of years before he came. There are scores of prophecies of Jesus in the Old Testament. My favorite one though, is the twenty-second Psalm. they open wide they’re mouths at me, like a ravening and roaring lion. Now let me rehash some of what we read above in case you missed it. So how long before Jesus’ crucifixion was this Psalm written? Biblical scholars place the composition of this Psalm in the time of the Davidic Dynasty, somewhere around 1000 BC.2 But even scholars who push for a later date, date the writing of this Psalm around 587 BC.3 So this Psalm was written at the latest about 600 years before Jesus underwent crucifixion. Now, what’s incredible about this date, even the later date, is that this is before the practice of crucifixion even existed yet.4 So the Psalmist mentioning hands and feet being pierced has no natural explanation. Why would God go through the trouble of announcing this beforehand in this strange mysterious way? Because God delights to fill us with awe at the beauty and mystery of his coming as a man. Jesus quoted this Psalm from the cross.5 It was one of his last words before he died. He cried out from the cross “My God, my God, why have you forsaken me?” which is the first line of Psalm 22. This was Jesus pointing us to this Psalm, and his death as the fulfillment of it. This Psalm is the poetry of God, displaying to us the agony of his own suffering for us. It is fitting that the most glorious event in the cosmos was foretold by it’s creator in song. In his infinite mercy, God became a man, was born into human history, and lived a perfectly righteous life, in order that he could take all our sin, shame, condemnation, punishment, and death, -all of it, on himself through the cross, and give us his brilliantly perfect righteous life in place of our own sinful one. Why was Jesus forsaken on the cross? So that we never will be. We will never be forsaken, left, forgotten, or neglected by him. There no longer remains punishment, shame, guilt, or fear. They were all placed on Jesus in the brutality of the cross. Instead he pours out on us his love, kindness, delight, and nearness. You are so dear to him, that he died for you. There is no more religious working, white knuckling, measuring up, earning, or trying to merit his approval, because his perfect, sinless, earthly life he gives to you; it is counted as yours. You are adored. Your sins are gone. You are free. And you will be an example of the glorious depth of his unparalleled love throughout the ages of eternity future. Welcome to the Stumblingstone Blog! This site is essentially going to be a place for my theological musings. Check it out, look around. There will be new stuff popping up now and then as I get it running! Thanks for your time, and enjoy! This is a place where connoisseurs of dead theologians can banter with fellow admirers of their dusty tomes. So lite up your pipe, grab a strong brew, and your favorite dead guy, and join us as we mine the depths of these forgotten relics.